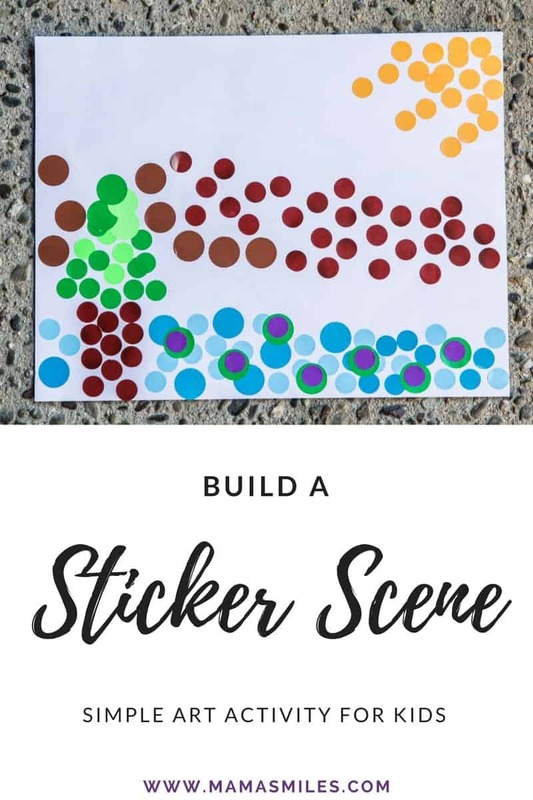 These sticker scenes make a great quick and easy art activity for kids! I love how open-ended this activity is – we use it on road trips. It’s also a great activity to have in your bag for waiting rooms and restaurants. Check out the list at the end of this post for more quick, easy, and highly portable DIY kids’ activities. 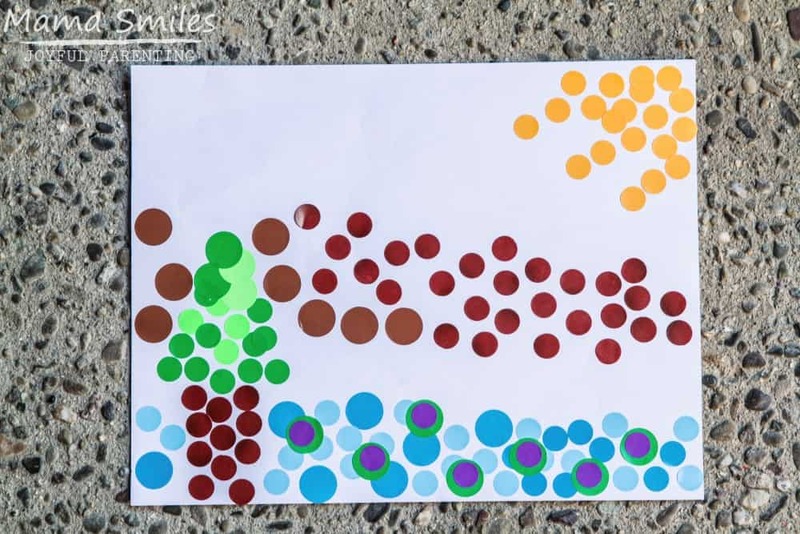 This sticker mosaic art activity is one of my favorite easy crafts for kids! All you need are round dot color coding stickers and some paper. Scissors and pens or markers can be added for further creativity. One thing I especially love about this art activity for kids is that it is completely open-ended! You can create a mosaic style scene, or use the stickers as portions of a drawing. My daughter Lily used the stickers to create a beach scene, as shown above. Johnny created an action-filled scene, where the stickers were colorful accessories rather than the main feature. This activity is super portable! We love it for road trips and doctor’s office waiting rooms. Sticker Scenes. It sounds so similar, but it’s completely different! It’s still easy art for kids, but you use kids’ stickers for this one instead of office supplies. Tissue paper and contact paper. Throw baggies of tissue paper and squares of contact paper into your bag. 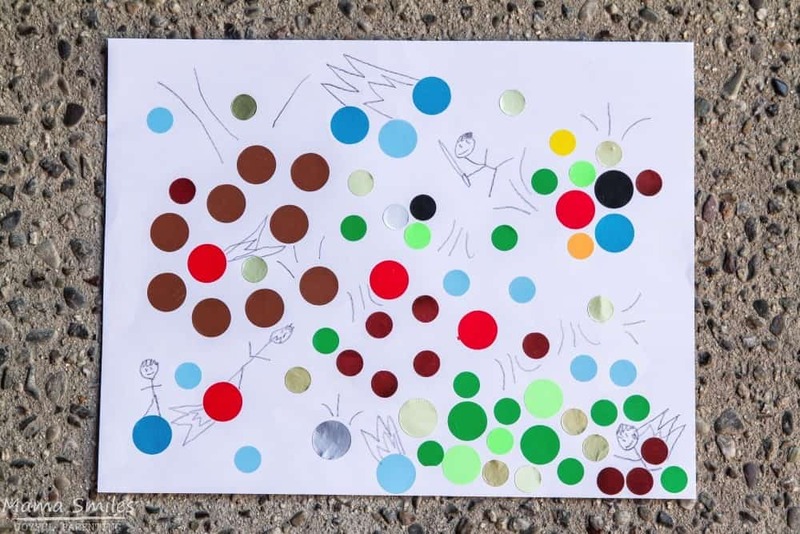 A simple drawing game that gets kids giggling. Paper golf. This game is excellent for developing spatial reasoning skills. 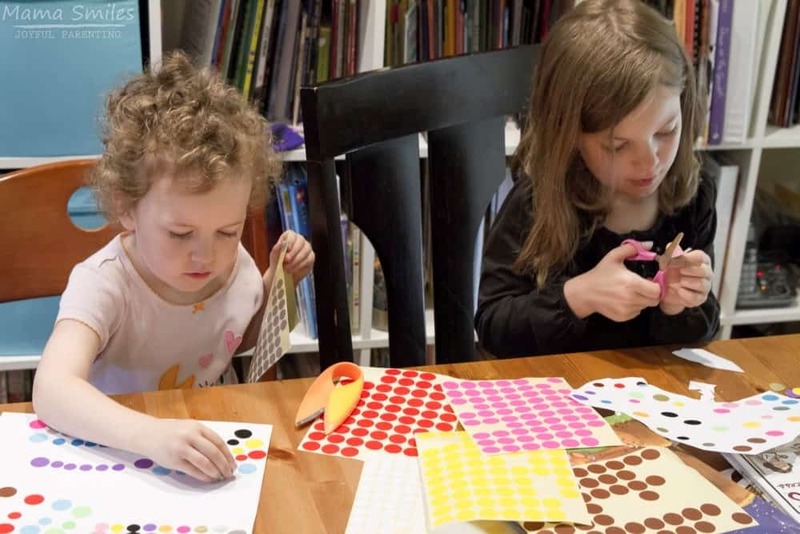 What are your favorite quick and easy art for kids activities? How about a favorite on-the-go activity that I should add to my list? I love to see photos, suggestions, and ideas in the comments below and on my Facebook page. You can also tag me on Instagram. We survived taking my kids to a high school graduation because of those sticker scenes when they were in preschool. What fun with just a basic sticker! Love the creativity it promotes! Amazing what can be done with the simplest supplies and a bit of imagination. I love these sticker mosaics! So simple and so beautiful!